This is a story all about how three brothers’ lives got turned upside down. 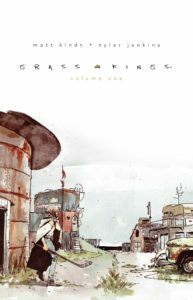 Grass Kings Volume 1 sees Robert, Sheriff Bruce and Ashur running a small trailer park fiefdom full of outcasts. On the other side of the lake is Sheriff Humbert, who sees the Grass Kingdom as a bunch of squatters. It’s not until Humbert’s wife runs away to the Grass Kingdom that Humbert finally has an excuse to go over and clear the area of its residents. From the start, Matt Kindt is telling the story of the lake, all the way from pre-colonial times to the modern day. The lake is as much a major part of the story as is the conflict between Robert and Humbert. It’s the source of the Kingdom’s hopes and fears. And the lake has skeletons of its own. The land around it has been soaked in blood from people throughout the centuries killing one another on it. 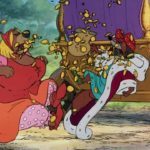 What makes Humbert a good bad guy is that his motivations are somewhat justified. The Grass Kingdom is seen as a bunch of squatters and they may be laboring a murderer. Robert is a bit of a mess when it all starts. He lost his daughter Rose mysteriously, and its not until he meets Humbert’s wife, Maria, that he’s been able to start healing. Volume 2 looks to be exploring more about what happened to Rose and whether or not there is a murderer in the midst of the Grass Kingdom. Can we talk about Tyler Jenkins’ beautiful watercolours? I’m gonna do it anyway. It’s gorgeous–the flashback scenes in particular. He doesn’t use too many colours for those scenes, but what he does use pops out at you against a background of white. Each scene has its own colours: blue and teal for a rainy night, and red for a crime scene with a lot of blood. The scene where Robert reconciles with his ex-wife is beautiful because Jenkins draws them in the ruins of a house. Jim Campbell’s lettering is so much fun. It’s not bright or extravagant. It doesn’t distract from the art. The bangs from guns firing look like chicken scratch writing, but it somehow adds to the character of the book. The size of some of the lettering lends to the volume of it as well. In the first chapter, after a kid from Cargill trespasses in the Grass Kingdom and Bruce shows him the town, we get an aerial view that looks like a postcard, and in no small part this is due to Campbell’s letters. The highlight for me in Grass Kings Volume 1 was near the end of Chapter 5 when Jenkins drew Robert as a knight during the Kingdom’s fight with Cargill Police. 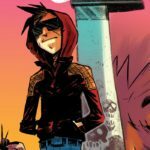 While this whole fight is going down, Kindt has Robert remember the story he used to tell Rose. About a knight on a quest to save a lost queen, and desperately fighting a wizard’s soldiers. The parallels between the story and the fight work out very nicely. 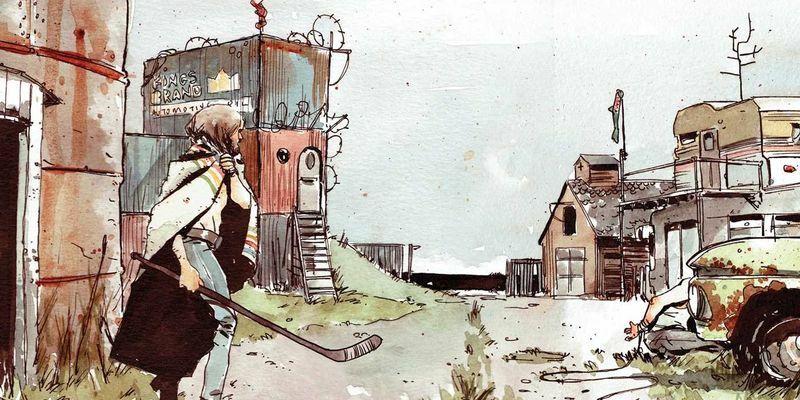 Grass Kings Volume 1 is a tale of two small towns. Jealousy, complicated relationships, rumours of a murderer: Grass Kings has it all. And, at its center, is a deep lake. Kindt plants so many details, and returns to many of them whether it pays off in the story or just offers some beautiful imagery by Jenkins. Definitely worth a read.